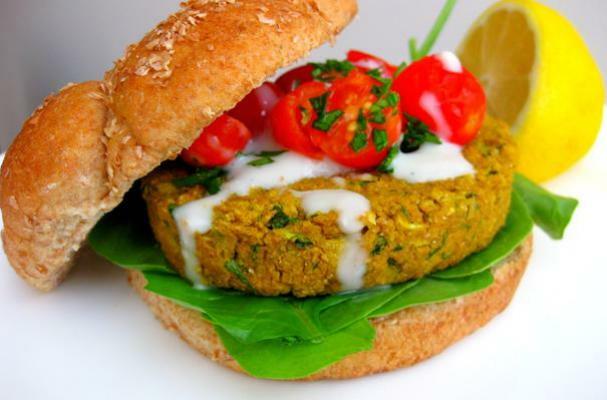 These light and crispy falafel burgers are richly spiced with cumin, chili powder and coriander then brightened with fresh parsley and a lemony tahini sauce. It's a satisfying and healthy lunch or dinner that will fill you up without making you feel guilty! Also try this version with a cool and creamy tzatziki sauce and a spicy kick of Sriracha! Combine the chickpeas,onion, garlic, parsley, flour, spices, and salt, and pulse until the mixture is well combined. Form the mixture into 4 large patties. Heat the oil in a large, nonstick skillet set over medium-high heat. Cook for about 3 minutes per side. Make the tahini sauce: Whisk the tahini paste with the water, lemon juice and zest, salt, and freshly ground black pepper in a mixing bowl. Serve the burgers in pita pockets or on a bun. Top them with tahini sauce, lettuce, and tomato.